The GFX-50S is a camera whose appearance is an immediate turnoff to me. The bump-out on the rear of the camera is unusual and off-putting. The grip on the GFX is nice and large though, so during hand-held shooting my little finger doesn’t fall off the bottom of the camera. It reminds me of a chunky DSLR, and my photographic roots are in Nikon DSLRs. The X1D grip is better shaped to the hand and it feels…well…”grippier”. In terms of physical design and appearance, the X1D is best in class. Fuji seems to have copied the UI layout of their X cameras onto the GFX body, so there are lots of buttons (most are programmable) and knobs and dials. Thankfully, the buttons can be programmed to have any of many functions or no function at all. Some can be locked so as not to be accidentally depressed during normal shooting. I’d like to meet the sadistic Fuji designer who thought it was a good idea to position the “Q” button (Quick Menu) on the grip in a spot where my thumb is bound to hit it accidentally and often. And giving the front and rear wheels a mushy button-press functionality seems a bit over the top. Once again, the simplicity of the X1D wins hands down. Few buttons, a couple of wheels, a menu controlled from the rear LCD touchscreen, and a PASM dial. That’s it. The GF lenses are large and heavy compared to the XCD lenses. They’re more like the Pentax 645, Hasselblad HC and Leica S lenses in heft and diameter. However, the 50S camera body itself is lighter than it appears and is well balanced with the lenses. Shooting handheld with either camera isn’t difficult, especially with GF OIS lenses (more on that later). The XCD lenses are small by comparison, heavier than they appear, and feel more solid and metallic. Fuji X owners may be familiar with the menu tree, but it took me an afternoon to go through all the options and set them for my particular shooting style and preferences. Many of the settings don’t seem to apply to shooting RAW stills with a medium formal camera so they’re lost on me. I’ve used Google more than once to understand what a particular setting means. However once setup is complete, I’ve rarely had to go back into the menu. In that sense, it reminds me of the Nikon DSLRs and Sony mirrorless cameras that I used before entering medium format territory. The X1D setup took about an hour to complete because the menu isn’t deep and the options are more optimized for medium format still photography. The GFX has a joystick to move the AF point (or center it). For me, that works better than using the rear LCD touchscreen to move the AF point on the X1D. Score a big win for Fuji on this one. The 50S ISO and shutter speed dials are OK, but not something that I’d say are necessary. I’d rather have an EV dial. When shooting from a tripod, I set the ISO at 100 and leave it there and I usually have the shutter speed dial on A (Auto/Aperture Priority). The GFX startup is quicker than the X1D, so you can be ready to shoot almost as soon as you turn the camera on. Likewise, with the GFX internal shutter options (including EFCS), there’s virtually no shutter delay/lag and no appreciable EVF lock-out, blackout or shutter shake during exposure. The X1D has an annoying EVF blackout associated with the sequence required for the Hasselblad leaf shutters. The 3.69 million dots OLED EVF on the Fuji is appreciably better (resolution and frame rate) than the 2.36 million dots XGA EVF in the X1D. I like having the articulating rear LCD on the GFX, especially when I’m shooting from a tripod and the camera is positioned lower than my height. The touch screens on both cameras are about equal in sensitivity and utility. I’ve convinced myself that the Fuji GF lenses are some of the best I’ve ever used. To me, they rival Leica S lenses in corner-to-corner, edge-to-edge performance. Some of that may be due to the in-camera “secret sauce” that Fuji applies to the files (automatically recognized by Adobe Lightroom/ACR). Most though is likely attributable to excellent lens design. The Hasselblad XCD lenses are no slouches either and I’d rate them equal in acuity and straight-out-of-the-camera performance to the Fuji GF glass. I like having the aperture ring on the GF lenses. I shoot mainly in Aperture Priority mode and can easily set the aperture by hand/feel. I know it’s a function of what I used with Nikon DSLRs and kinda retro. Zoom lenses!!! With just 2-3 GF lenses, I can cover my entire shooting repertoire. The GF 32-64mm is super. In February 2019, the GF 100-200mm starts shipping, and a GF 45-100mm zoom has been announced for 2020. The 32-64mm, 100-200mm and the GF 23mm make for an excellent three lens kit. With the X1D, I carry the 21mm, 30mm, 45mm and 90mm to cover just a part of that focal length range. Hasselblad announced a zoom lens in November 2017, but that lens has yet to materialize. And the XCD 135mm and 1.4x TC (that were promised for December 2018 availability) are MIA as of this date as well. Three of the GF lenses have OIS (optical image stabilization). The GF 120mm macro, 250mm and new 100-200mm are equipped with this feature. Also, both the 250mm and the 100-200mm can be used with the GF 1.4x TC to increase the focal length. The 50S has a tilt adapter for the EVF that allows the EVF to be tilted upwards or at an angle to the back or both. This is especially useful when the camera is positioned on a tripod lower than normal height. The combo (EVF + tilt adapter) does add some weight and depth to the camera that may be annoying to some. Bracketing, bracketing, bracketing. I’ve never seen so many bracketing options (AE, Film Simulation, Dynamic Range, ISO sensitivity, White Balance, and Focus Bracketing). Focus Bracketing is especially interesting. The GFX cameras have a port for a remote release cable, unlike the X1D. While X1D users have figured out how to use a remote release cable plugged into the headphone jack, it isn’t endorsed by Hasselblad, nor has Hasselblad introduced a cable of their own. Face/eye detection. I’m guessing that Hasselblad doesn’t/didn’t have the intellectual property (aka firmware) to accomplish this with the X1D or the X1D processor isn’t sufficiently powerful to perform this function effectively. The GFX does it well in good lighting. Live histogram. This is a feature that has been on almost every X1D owner’s “wish list” for two years and still hasn’t materialized. Not a huge differentiator, the eyecup of the 50S is soft rubber and removable unlike the hard unremovable eyecup on the X1D. I’m a fan of soft rubber eyecups. The X1D has a GPS accessory that fits into the hot shoe. The GFX cameras rely on the use of a smartphone with GPS to record GPS data. The latter works but requires an extra step (and smartphone battery drain) to accomplish the same objective. “Geriatric” icons and controls. The X1D seems to be designed for people my age and can be operated (by me) without reading glasses. The icons on the rear LCD are huge and easily deciphered. The GFX has a touch screen panel (called Quick Menu) for quick access to features regularly used, but the icons are tiny by comparison and are not easily understood without some study. There’s no appreciable difference that I can detect between the IQ of the two cameras. The Auto WB on the Fuji may be slightly better (i.e., barely any post-processing adjustment necessary even in mixed lighting). The colors seem true on each, so I’ll have to use a color test chart to test the difference. In my opinion, IQ would not be a reason to choose one over the other. Both are “truer” than the 645Z. Here there’s no contest. 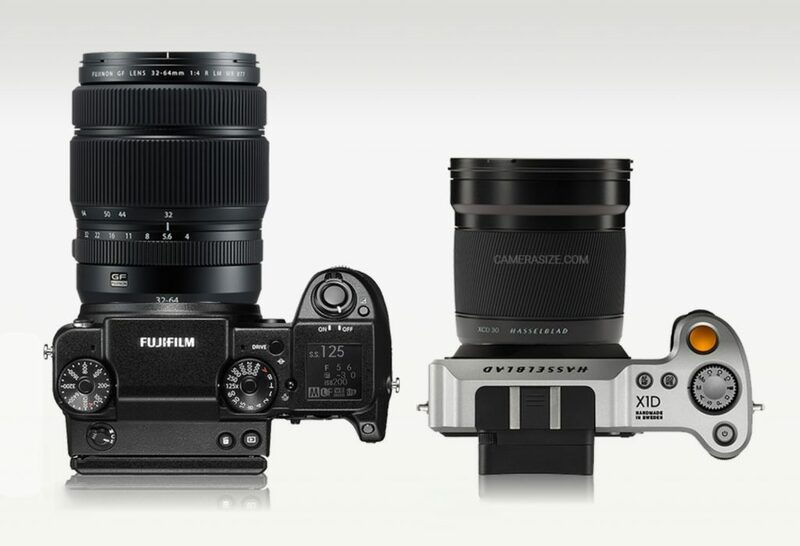 Fuji wins both on the camera body and lens pricing. The new GF 100-200mm zoom is about $2k. An equivalent XCD lens would likely be twice that amount. The Fuji camera bodies are $4.5-5.5k. The Hasselblad X1D body is twice that or more (new retail). Fuji US customer service is outstanding. I’ve heard that from a Hasselblad dealer. Fuji has a good record of firmware upgrades. They’ve come at a fast pace for the Fuji X cameras and the GFX is on firmware version 3.30. Hasselblad’s latest update for the X1D (v1.22) allows exposure bracketing to be used with a self-timer delay. Really?!! The X1D was announced in 2016. This is 2019!! The 50S is a more stable platform at this point in its product life cycle. The common quality control problems that were present on every X1D I touched are nowhere to be found on the Fuji. The firmware is stable. There have been no spontaneous shut downs requiring restarts or battery removal. And the controls (buttons, wheels, dials, etc.) all work as designed all the time. It’s a reliable tool. My current intention is to keep and use both systems. Vive la différence! This entry was posted in Uncategorized and tagged Fuji, FujiFilm, GFX, GFX-50c, Hasselblad, Medium Format, Mirrorless, Photography, X1D, X1D-50c.